Newcastle, BBC Mersyside and The Unicorn! Kirsty who also stayed over, also felt bad – so it must be something to do with Walsall air! On Monday I had loads to do, all very functional. I sorted out some investments and pottered around at the swimming pool (the life guard recognised me from a skiiid holiday when we were kids!) and drove up to Newcastle-upon-Tyne. Sarah was revising so wasn’t meeting her til Tuesday so just chilled in my little room up north. But I never sleep well the day before a hospital trip. I met Sarah and we hit ‘As You Like It’ – a lovely eatery in a horrible building in Jesmond. We decided we are going to go on a spa weekend together - any ideas? I drive back to Widnes (about four hours) and mum met me in Widnes and we went to The Unicorn (see pic) for some food. The lovely waitress there has just come back from Thailand – so I ordered Thai lamb! Bless. In fact both waitresses there are cute – always a bonus! I went to Liverpool on Thursday to be interviewed on Radio Merseyside (it will be a 30-minute slot to be broadcast in April) and spent the day with Roger Phillips and his team. Good contact-building and nice to put names to faces. It was really interesting…and it felt good to be back in journalism (if only for a day!) – traffic was a nightmare though and £11 to park! Everyone was really kind. But there again, everyone is in Merseyside…. Went to the GPs (on his request) and he asked what I was doing there! Anyway...I asked hi to sign me up for the 'Recipe For Health' programme - which would give me my own gym trainer to help try and slow down my loss in lung capacity.. This is very bizarre as I am going to see my consulant in Newcastle-upon-Tyne next week and they ALWAYS do blood presure tests there!!! Halton Borough Council has been hitting the headlines for all the right and wrong reasons this week. So it has been good to have a few days off. Anyway.....Just been chatting to Diana.B on the Yahoo Messenger....She takes gorgeous pics of sunsets and has emailed me some of her latest...Why can't I be that creative!!! 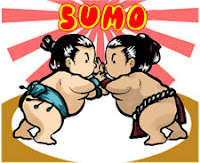 17,000 visitors to my site...Pixie love to all of you..
Another week over…begun…etc….Strange week including sumo wrestlers at the library……Comic Relief at Erik/Diana's in Willenhall and lunch in Walsall with Dan…. And Eurovision - How crap is out entry (yet again!) I reckon we should get Terry Wogan and Napalm Death to write and perform a song next time....With Stephen Fry on backing vocals. I popped back to Staffordshire for Mother's Day and also gave the kittens some TLC. It is their b'day next month (their first one!) Any ideas? They liked the snow yesterday! I got a DVD film on which I feature this week (thank's for that!) and I am on there working out at the gym - how I miss those heady days.... I actually look toned and fit on the screen. Gosh....What happened to that Mark? My GP has lost my application for the Recipe For Health – free gym sessions etc Doh..
Gonna be another strange week as off from Thursday to Wednesday – but that includes a day-and-a-half in Newcastle-upon-Tyne– outpatients. At least I get to have lunch with Sarah. Highlight of day? Seeing the lovely G.O of course - yes you DID/DO look amazing in those pictures! Hope you are all fine and dandy – and your weekends were full of glittery delights. Friday I had a meeting at Norton Priory, which is a bit of a hidden gem in Halton – It has this really old St Christopher statue and herb gardens. I am finding my lungs are less painful after a relaxing swim…I am hoping now to to it every other day.. I got the Klaxons album and Johnny Cash American Recordings out from the library for the journey to Chester. I went to see Dave H from the Chester Chronicle….who I last saw 14 years ago when we were both on the NCTJ journalism course at Sheffield College! On the Sunday we went for brunch in town. Chester on a Sunday is as busy as Widnes on a Saturday. Keep smiling… and hello to Sam I and the lovely G.O! God rest John Inman....But the whole of Britain is saying 'I'm free' on every radio station at least twice an hour----- aaaaaagh. Imagine what it will be like when Molly Sugden passes away! PS: I hope you like the picture - it's my Widnes abode! Apologies for not writing much for a few days. It’s been hectic in Mark-ville..Oh the life of a media mogul eh!? At the weekend I ventured to Warrington (about 8 minutes away by train). 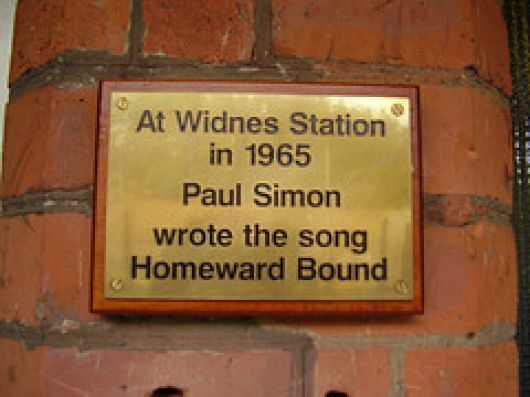 Widnes Station is where Paul Simon is rumoured to have written Homeward Bound. Warrington was full of charity muggers, good cheap shops and shellsuits! I am still having problems with my GP not seeming to want to prescribe drugs ordered by my consultant….Ho hum…. I have went to a health centre to take some photos for a press release and met up with a cool sports development officer who seems to be really pro-active (and a friend of someone I vaguely knew and remember as being cute at school – if that makes sense!). I REALLY miss going to the gym and she is going to try and get me fit enough to start going again. Lets defy these doctors eh?